Don Luigi Sturzo (Italian pronunciation: [luˈiːdʒi ˈsturtso]; 26 November 1871 – 8 August 1959) was an Italian Catholic priest and politician. Known in his lifetime as a "clerical socialist," Sturzo is considered one of the fathers of Christian democracy. Sturzo was one of the founders of the Partito Popolare Italiano in 1919, but was forced into exile in 1924 with the rise of Italian fascism. In exile in London (and later New York), Sturzo published over 400 articles (published posthumously under the title Miscellanea Londinese) critical of fascism, and later the post-war Christian Democrats in Italy. Born in Caltagirone, Sicily, Sturzo was ordained on 19 May 1894. After his graduation he taught philosophy and theology in his native city. From 1905 to 1920 he was vice-mayor of Caltagirone. Sturzo was among the founders of the Italian People's Party (Partito Popolare Italiano, PPI) in January 1919. The formation of the PPI, with the permission of Pope Benedict XV, represented a tacit and reluctant reversal of the Vatican’s Non Expedit policy of non-participation in Italian politics, officially abolished before the November 1919 elections, in which the PPI won 20.6% of the vote and 100 seats in the legislature. The PPI was a colossal political force in Italy: between 1919 and 1922, no government could be formed and maintained without the support of the Italian Popular Party. However, a coalition between the Socialists and the PPI was deemed unacceptable within the Vatican, despite being proposed by Prime Minister Giovanni Giolitti in 1914, and later imagined by his progressively powerless successors—Bonomi (1921-1922) and Facta (1922)—as the only possible coalition that excluded the Fascist party. Sturzo was a committed anti-fascist who pontificated on the incompatibility of Catholicism and Fascism in such works as Coscienza cristiana, and criticized what he perceived to be "filo-fascist" elements within the Vatican. Sturzo was not among the 14 PPI members who defected from the party—under pressure from Pope Pius XI—to approve the Acerbo Law in July 1923. Sturzo was forced to resign as the general secretary of the PPI on 10 July 1923, after being unable to obtain the support of the Vatican to continue to oppose Mussolini. He further resigned from the Party board on 19 May 1924. After the departure of Sturzo, the Vatican endorsed the formation of Unione Nazionale, a pro-fascist Catholic political party, which hastened the rupture of the PPI, and provided political cover for its former members to join Mussolini’s inaugural government. Following the Matteotti affair (after which Sturzo thought the Aventine Secession should return to Parliament), Cardinal Secretary of State Gaspari acceded to the wishes of Mussolini and forced Sturzo to leave Italy before the re-opening of Parliament on the anniversary of the March on Rome. Sturzo was exiled from Italy for 22 years, first in London (1924-1940), then in the United States (1940-1946). Sturzo left Rome for London on 25 October 1924. Officially, Sturzo was consigned to a 3-month study trip in London; however, the choice of London was likely intended to isolate Sturzo because he did not speak the language and it did not contain a large population of like-minded Catholics. 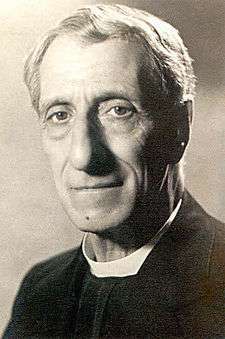 He moved to the residence of the Oblates of St. Charles in Bayswater, and then in January 1925 to the Servites at the Priory of St. Mary in Fulham Road, where he was asked to leave in early 1926 because the Servites' mother house in Rome was being denied funds as long as Sturzo was their guest. That year Sturzo refused an offer from the Vatican, communicated through the Cardinal of Westminster Francis Bourne, of a chaplaincy in a convent in Chiswick and lodging for his twin sister, Nelina, in exchange for ending his journalistic activity and issuing a "spontaneous declaration" that he was completely retired from politics. Instead, in November 1926 Sturzo moved into a flat at 213b Gloucester Terrace in Bayswater with his sister where they lived as lodgers until 1933. After the signing of the Lateran Treaty in 1929, Sturzo was offered an appointment as a Canon of St. Peter's Basilica in Rome, again, in exchange for his permanent renunciation of politics. In September 1940, Sturzo boarded the Samaria in Liverpool bound for New York, hoping for an academic appointment. However, he was sent to St. Vincent's Hospital in Jacksonville, Florida, which was filled with dying priests. Beginning in 1941, he cooperated with agents from the British Security Co-ordination, the Office of Strategic Services, and the Office of War Information, providing them with his assessments of the political forces with the Italian resistance movement and radio broadcasts to Italy. Sturzo returned to Brooklyn in April 1944, but his return to Italy was vetoed by the Vatican and Alcide De Gasperi (who differed with Sturzo on the scope of the constituency of Christian democracy and a referendum to abolish the monarchy) in October 1945 and May 1946. Sturzo returned to Italy on the Vulcania in August 1946 (after the June Referendum had abolished the monarchy), but did not play a dominant role in Italian politics, retiring to the outskirts of Rome after landing in Naples. He was, however, made Senator in 1952 and Senator for life in 1953 by President Luigi Einaudi. Sturzo died in Rome in 1959 at the age of 87. ↑ Living Age. 1922, May 13. "Clerical Socialist." Vol. 313, p. 374. ↑ Moos, Malcolm. 1945. "Don Luigi Sturzo--Christian Democrat." The American Political Science Review, 39(2): 269-292. 1 2 Farrell-Vinay, 2004, p. 166. 1 2 Farrell-Vinay, 2004, p 159-160. ↑ Skowronski and McHale 1983: 575. ↑ De Grand 2004: 28. 1 2 3 Farrell-Vinay, 2004, p. 160. ↑ Riccards 1998: 109; Pugliese 2001: 57. ↑ Tallett and Atkin 2003: 206. 1 2 Farrell-Vinay, 2004, p. 161. ↑ Farrell-Vinay, 2004, p. 161-162. ↑ Farrell-Vinay, 2004, p. 172. 1 2 3 Farrell-Vinay, 2004, p. 173. De Grand, Alexander. 1982. Italian Fascism: Its Origins & Development. Lincoln: University of Nebraska Press. Farrell-Vinay, Giovanna. 2004. "The London Exile of Don Luigi Sturzo (1924-1940)." HeyJ. XLV, pp. 158–177. Lee, Stephen J. 2000. European Dictatorships, 1918-1945. New York: Routledge. Pugliese, Stanislao G. 2001. Italian Fascism and Anti-Fascism: A Critical Anthology. Manchester University Press. Riccards, Michael P. Vicars of Christ: Popes, Power, and Politics in the Modern World. New York: Herder & Herder. Skowronski, Sharon, and McHale, Vincent E. 1983. Political Parties of Europe. Greenwood Press. Tallett, Frank, and Atkin, Nicholas. 2003. Priests, Prelates and People: A History of European Catholicism since 1750. New York: I. B. Tauris.